Many students dream of attending a prestigious institution such as Harvard University. However, in the late 1990s and early 2000s, Tonisha Calbert and Kimberly Vargas became the first two students from the Cleveland Metropolitan School District to attend Harvard since 1989 – and both women are College Now (formerly the Cleveland Scholarship Program) alumni, as well! Read on to learn how College Now helped these two attend their dream school. Growing up in East Cleveland with her mother and five younger siblings, Tonisha tended to excel in school. She was vice president of her class, a member of the National Honor Society, and a producer and reader of the homeroom announcement broadcasts at Jane Addams High School. However, when it came time to think about college, Tonisha did not have the money to even apply. With a personal essay focusing on overcoming her shyness attached, Tonisha’s application was sent off, impressing admissions officials at Harvard and resulting in her acceptance to the school and a sizeable financial aid package. However, there was still a gap Tonisha had to meet. With College Now’s help, Tonisha earned $18,000 in additional scholarships, and was able to attend Harvard in the fall of 1998. After graduating in 2002 with her BA in government with a focus on ancient political philosophy, Tonisha went on to Columbia University’s law school, earning her JD in 2007. She worked as a corporate associate for Willkie Farr & Gallagher in New York City before returning to Ohio to earn her MA from Ohio State University in 2013. Currently, Tonisha is a PhD candidate in the Department of English at Ohio State. Similar to Tonisha, Kimberly Vargas excelled in school while her family struggled to make ends meet with welfare and food stamps. On track to graduate as salutatorian from James Ford Rhodes High School, Kimberly’s guidance counselor pushed her to apply to Harvard. With the help of College Now, Kimberly was able to pay for the pricey entrance exams and application fees required to submit a competitive application. 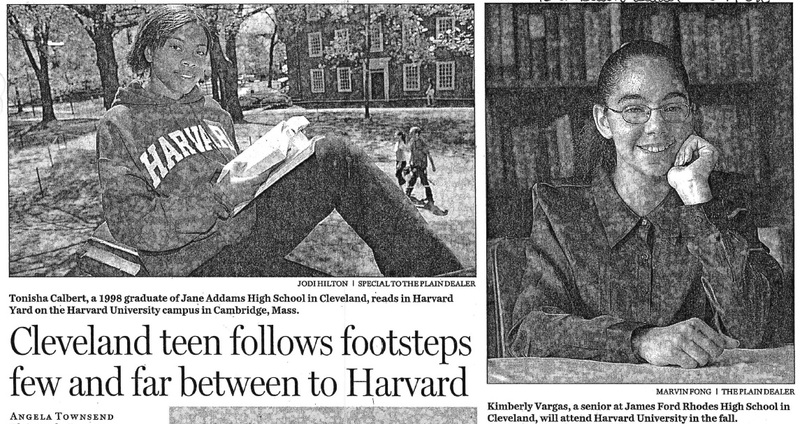 Even after she got her acceptance letter, however, Kimberly still viewed attending Harvard as an impossible dream. With a $40,000 per year price tag, “I just assumed I wasn’t going to Harvard,” she said. Winning a full scholarship, however, changed all that. In 2006, Kimberly graduated from Harvard with a degree in psychology. Realizing that she wanted to return to Cleveland and her family, Kimberly then moved back home where she earned her master’s degree from Cleveland State University and went on to work as a school psychologist for the Cleveland Metropolitan School District. Since Tonisha and Kimberly, a number of College Now scholars have applied to and attended Harvard University (including David Boone, a 2012 graduate of MC2STEM in the Cleveland Metropolitan School District) and other prestigious schools throughout the country. Through programs such as the Cleveland Foundation College Now Scholars Program, more students are applying to and receiving acceptances to more elite institutions than ever before, which you can read more about here.